In case you were wondering after yesterday's post, acetaminophen won. My sensor bit the dust after a good run, and I decided to delay putting in a new sensor and take acetaminophen instead. I'm a bit addicted to my CGM. Ok, a lot addicted. I wear a sensor 24/7. As soon as a sensor dies, I put a new one in. I can count the number of CGM breaks I've taken in the last two years on one hand. 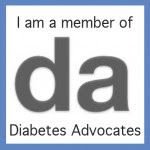 Sometimes I have to remind myself that I lived with diabetes for 17 years without a CGM. And I did ok. I have to listen to my body and trust my instincts. Now, I'm off to the doctor to make sure I don't have strep. Yay? Completely unrelated, I've been updating my Diagnosed As Adults list. When a local friend was diagnosed with T1, I was trying to find other people diagnosed with T1 or LADA as adults for her to connect with. I got so many names, I decided to share them! If you were diagnosed as an adult and blog or have Twitter, please comment or email me so I can add you to the list. The more, the merrier! When we had to do with Bean's CGM for a week while waiting for the Rx and shipping issue to be sorted out, I felt like I was going to die! It's amazing how valuable that little grey thing is!! Jess, can you add me? Got you added, Stephen! Thanks! My husband lived all his life, nearly 30 years without the sensor but now he doesnt go a day without his CGM, literally. Its needed now since he doesnt feel his lows. So your not the only one with an addiction! Hi Jess, can you add me too?